HIGH POINT, NC (June 15, 2018) - Top-ranked Jack Hall began the final round of the National Senior Hall of Fame Amateur one-stroke ahead of some of the best players in the senior game. On Friday none of those challengers were able to keep pace with Hall's torrid pace as he ran away from the field for his first AmateurGolf.com Senior Ranking event win of the season. Beginning the day 6 under, Hall sprinted to the finish firing a stellar 7-under 65 to post 13 under and eight shots in front of Gene Elliott, the runner-up at 5 under. Hall, a second place finisher three times this year, held the lead after 36 holes following rounds of 70-68 before closing with the round of the tournament. The Savannah, GA resident had been knocking on the door the last two years at Willow Creek Course at High Point Country Club finishing tied for sixth in 2016 and tied for second last year before breaking through with his first win at the event. Hall has now earned points in nine ranking events this season, including at U.S Open Senior Qualifying where he medaled. Brady Exber was third at 4-under while Steve Harwell and two-time champion Paul Simson were 2-under in a tie of fourth. The Super Senior and Legends Division both went to playoffs with Russ Perry winning the Super Senior title and Dan Marsh taking it in the Legends Division. Perry finished regulation tied with Alan Thielemann at 2-under while Marsh ended regulation tied with Bob Lewis at 3-under. Lewis was trying to win the tournament in the same year that he was inducted into the Hall of Fame. 2018 National Senior Hall Fame Inductee: Bob Lewis, Jr.
54 hole invitational started in honor of Dale Morey (a member at Willow Creek) typically draws one of the strongest fields of the year. 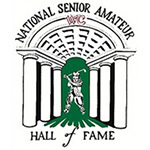 The tournament organizers desire to create and maintain a true and meaningful Hall of Fame that recognizes the best in amateur golf of national and international acclaim. Their list of previous inductees and champions attest to our success in these efforts, most have won either the U.S. or the British Senior Amateur Championship or innumerable other prestigious championships such as the U.S. Amateur.